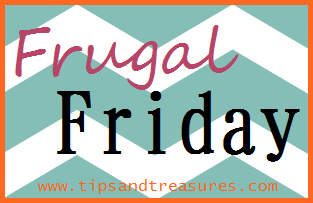 Welcome to Frugal Friday! In an effort to concentrate on being wise with our spending and saving, each Friday I'm sharing some of our latest frugal efforts or activities here on the blog. 1. I made these adorable button headbands for my daughter with items that we already had on hand. 2. We used our cloth napkins instead of paper napkins. I LOVE that we rarely need to buy paper napkins, although we do keep some around for guests or if we don't have any clean cloth napkins. 3. Received a book in the mail for my daughter from Bookmooch, a book swapping site that I belong to. This is where the majority of my reading material comes from. 4. Created costumes for both of my kiddos that needed to dress up as book characters for school, and managed to do so without buying a single thing. Yippee! What frugal things have you done this week? Share in the comments or link to your own blog post!